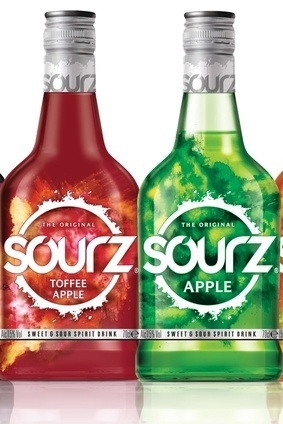 Beam Suntory has unveiled new packaging for its Sourz spirits range as it seeks to “stay relevant” to its core young adult consumers. The company will roll out the “radical redesign” in all its markets over this month, it said today (17 June). Each bottle will have a new skin coloured to reflect each flavour across the Sourz line-up, as well as a “splash” pattern. The redesign coincides with the launch of the brand's 'This is our Summer’ campaign and the addition of Sourz Toffee Apple as a permanent flavour after its introduction last year as a limited edition. In Beam Inc's last full-year results, prior to its takeover by Suntory, Sourz sales were flat.